On October 23, 1921, an American officer in the French town of Chalons-sur-Marne selected the first “Unknown Soldier” to represent and honor the American soldiers who’d lost their lives in the war, both known and unknown. The decision to select such a soldier and bury him in a special site in Arlington National Cemetery was approved by Congress on March 4, 1921. Two months later, on Memorial day, the remains of four unknown soldiers were exhumed from four different cemeteries in France, near the sites of great battlegrounds in Somme, Saint-Mihiel, Aisne-Marne and Meuse-Argonne. These remains were then placed in four identical caskets. The original records showing the internment of these bodies were searched and the four bodies selected represented the remains of soldiers of which there was absolutely no indication as to name, rank, organization or date of death. The bodies of the four soldiers arrived at the Hotel de Ville in Chalons-sur-Marne on October 23rd and remained there overnight. The next morning, American and French officials entered a hall where the four caskets waited, with each casket draped with an American flag. The soldier tasked with making the final selection, Army Sergeant Edward Younger, had been highly decorated for his valor during the war. In order to indicate which casket would be the chosen Unknown Soldier, he was given a spray of white roses to lay on the casket. Younger entered the chamber and walked around the caskets a few times before finally selecting the second casket from the right. The remaining caskets were then interred in the Meuse Argonne Cemetery. The casket selected by Sergeant Younger made its way to Paris and then to Le Havre, France, where it boarded the cruiser the Olympia for its trip across the Atlantic Ocean to the United States. 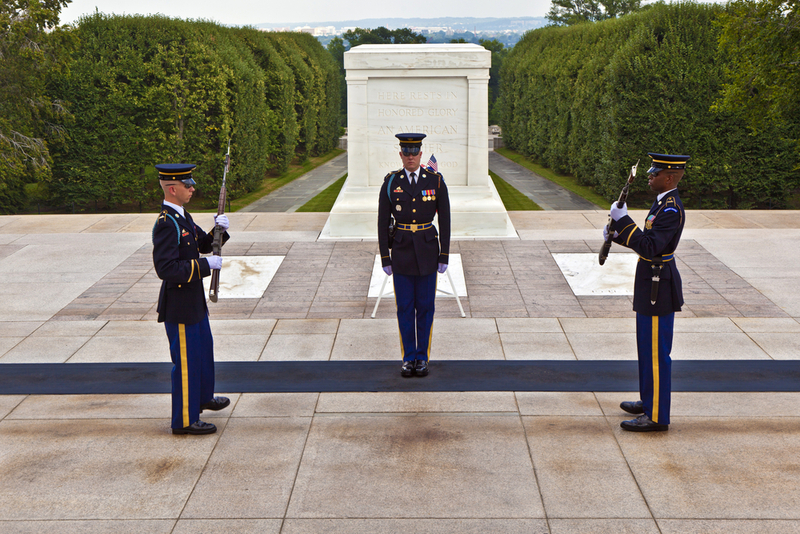 The Unknown Soldier was laid to rest in Arlington National Cemetery, his casket bearing the inscription “An Unknown American who gave his life in the World War.” On the plaza itself, the following words are inscribed, “Here Rests in Honored Glory An American Soldier Known But To God”. In later major wars, other unknown soldiers would be selected to join the first, such as on August 3, 1956, when President Dwight D. Eisenhower signed a bill that required Unknown Soldiers be selected to represent the soldiers lost during the Korean War, as well as WWII. The Unknown Soldier for Vietnam was much harder to find, owing to advancements in medical technology that made it difficult to find the remains of a dead soldier that couldn’t be identified. Nevertheless, one was found and laid to rest on May 28, 1984 next to his fellow Unknowns. Today, of course, one would image it might truly be impossible to find an Unknown Soldier for any modern wars unless there is a loss of the military medical records coinciding with one of the soldiers killed who can’t be identified in some other way.